Schematic illustration of how nature builds fracture-resistant materials like nacre or sea urchin spines using a ‘bricks and mortar’ building principle with hard but brittle crystalline bricks bound together by a ductile mortar. Cement is built from randomly oriented nanoparticles, which are glued together. For cement, these are nanoplatelets, or gypsum needles. Schematic illustration of C-S-H mesocrystal formation via pH increase. Concrete is one of the most commonly used building materials but, despite its strength, lacks elasticity or flexibility unless reinforced with steel. Calcium silicate hydrate (C-S-H) is the main component of concrete, responsible for its great strength. 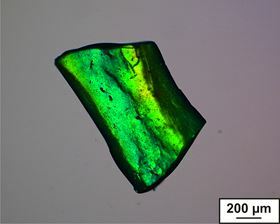 Usually, C-S-H nanoplatelets aggregate randomly in the material. But, inspired by the highly ordered structure of natural materials, researchers from the Universities of Konstanz and Stuttgart, BASF, and the Max Planck Institute of Colloids and Interfaces in Germany and the Université de Bourgogne-Franche-Comté in France have brought order to C-S-H mesocrystals [Picker et al., Science Advances 3 (2017) e1701216]. “We have changed the nanostructure of cement and made it more ordered by taking inspiration from the structure of sea urchin spines,” explains Helmut Cölfen of the University of Konstanz. The team used a polymeric binder to create highly aligned C-S-H nanoplatelets. The process is rather like building a wall: C-S-H nanoplatelets are stacked up like bricks with a polymer ‘mortar’ holding them together. Stabilizing C-S-H with a binder such as poly (1-vinylpyrrolidone-co-acrylic acid) (PVP-coPAA) or poly(acrylamide-co-acrylic acid) (PAAm-co-PAA) leads to a hybrid material with a bending strength similar to that of natural mother-of-pearl (or nacre), outperforming all traditional C-S-H-based materials to date. 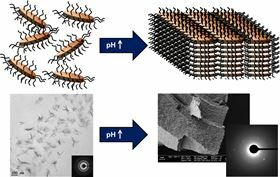 “We have produced the first mesocrystalline C-S-H, meaning that all the nanocrystalline C-S-H platelets are self-assembled and mutually oriented in the crystallographic register interspaced by a flexible polymer binder,” says Cölfen. Deformability and nanoindentation tests of the C-S-H mesocrystals indicate that the material can withstand elastic deformations without failing or permanent deformation. In fact, the C-S-H mesocrystals have 40–100 times the bending strength of traditional concrete. The key to the improved properties lies in the ordered arrangement of the C-S-H nanoplatelets. “If you exert a force, the first hard but brittle crystal will break, but then the ductile mortar needs to be pulled apart before the next crystal can break. This decreases the crack energy,” Cölfen explains. Although the advance cannot be applied in commercial concrete immediately because the polymer mortar would be too expensive on a large scale, the mesocrystals could be used as an additive in cement to stop cracks. The next step, he believes, is to explore the possibilities of replacing the expensive polymeric mortar with an inorganic, cheaper alternative that can fulfil the same ordering role for C-S-H nanoplatelets. “This report of a bioinspired material based on calcium silicate nanocrystals hits the nail right on the head by demonstrating the tremendous significance of nanoscale assemblies for everyday technologies,” comments Nicholas Kotov of the University of Michigan. This article was originally published in Nano Today (2018), doi: 10.1016/j.nantod.2017.12.003.